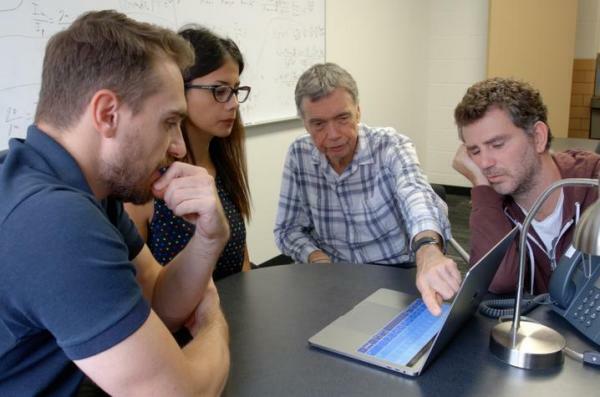 (Left to right): Marios Chatzikos, an assistant research professor in the UK Department of Physics and Astronomy; Maryam Dehghanian, a graduate student in the department; Gary Ferland; and Francisco Guzman, a postdoctoral scholar in the department. With continuous funding from the National Science Foundation (NSF) and NASA since 1981, Gary Ferland has developed a special computer code to study how light from distant celestial bodies is produced. "In astronomy, we (have to be) very clever in figuring out ways to analyze the messages that the stars send us, and the light we receive is difficult to interpret; it's not produced in a simple way," said Ferland, who is a professor in the UK College of Arts and Sciences'Department of Physics and Astronomy. "So, I started in Cambridge developing a computer code that predicted exactly how light would be emitted." Ferland's project, known as "Cloudy," helps astronomers understand light that is received here on Earth. It allows them to study objects in our own galaxy, as well as objects at the edge of the universe. "We can look at things here and now, and look very, very far back in time," said Ferland, who has used Cloudy to study relatively close solar systems and extremely distant quasars that emitted light 12-13 billion years ago. Ferland explains his process by describing how light passes through a prism and becomes a rainbow, or spectrum. "Spectroscopy is the science of taking that light and then teasing out the information that tells us where it came from," he said. "We know what the answer is — the answer is the spectrum we saw. What we're trying to figure out is what happened out there." By applying the laws of quantum mechanics, Ferland and his team use large computer simulations to predict exactly what light will come out. And then, using the spectrum, they go back to make hypotheses about how received light was produced. The technology has been widely used by astronomers all around the world in the nearly 40 years it has been openly available, making it one of the most highly cited projects in astronomy. "Understanding what the messages are telling us from the stars is so important to everything we do," Ferland said. And by learning Cloudy's code, Ferland says his students are also gaining skills that can be applied to physics, astronomy and beyond. While many of his former students are now professors and working in the astronomy field, one now works as an engineer for Google. "These (computing) languages are very familiar to how banks do transactions, how you purchase something on the web — so the skill set that's being taught by working on Cloudy directly transfers over to skills that are needed to go out and get a job in Fayette County, or Kentucky, doing something that's computer related," he said. "Science moves very quickly, and it's the young people that really make it possible. Because all of this is human effort."